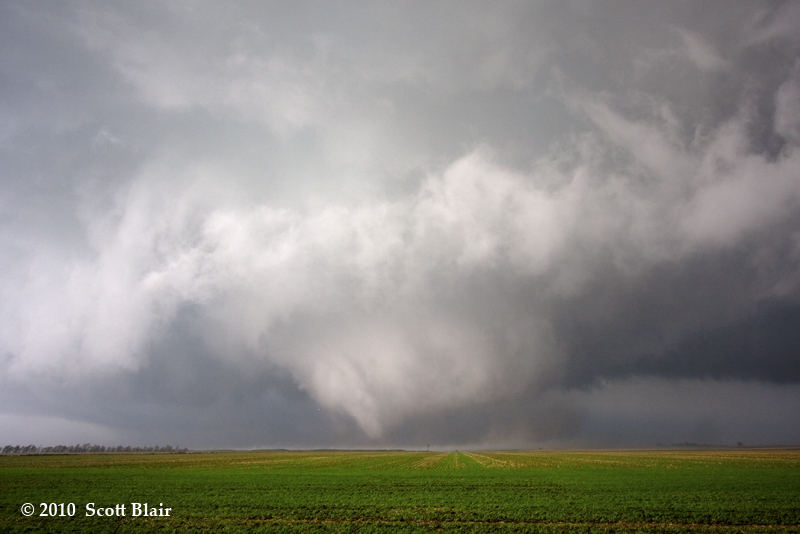 I ventured out with Derek Deroche and Jared Leighton with an initial target near Independence, KS. We shifted our target southwest by 50 miles by early afternoon as it appeared the surface low’s progression was a little slower than anticipated. Jumped on a region of persistent low-topped convection located ENE of the sfc low south of Ponca City by mid afternoon. For the most part, low-level structure appeared fairly benign from our vantage point east of Burbank, OK. We followed it northward on a rough dirt road to Foraker, then up Hwy 18 to Grainola. As we approached the KS/OK border, we noted a new stout updraft developing along the trailing line of arcing convection, immediately next to the mature tower. As this vertically grew, we observed a well-defined funnel cloud develop underneath the updraft base, associated with the new robust convection just SE of Cedar Vale, KS. This feature persisted for less than one minute before dissipating. From the existing sfc obs, we inferred this tower was in close proximity to the sfc warm frontal boundary draped across SE KS. 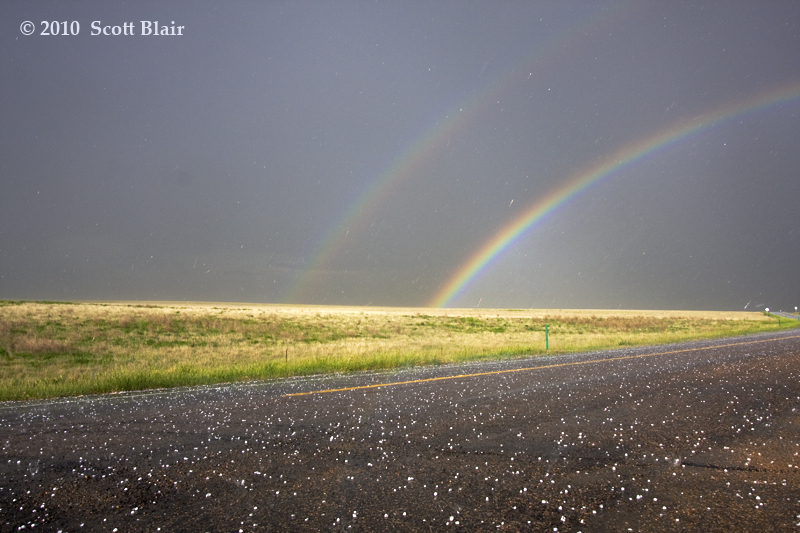 Thereafter, we made several passes through hail swaths, with the biggest stones near a quarter. We stopped to enjoy the low-topped convection prior to sunset north of Sedan, KS and called it a day. I departed Lawrence, KS by mid morning with a preliminary target of northeast New Mexico. The target was selected to optimize stronger mid-level flow juxtaposed with the upslope regime along the Raton Mesa and the nearby baroclinic boundary. Convection developed in this region by mid afternoon, with one persistent region of redevelopment virtually in the same spot in Union Co, NM for several hours. I finally arrived shortly after 5pm CDT and watched the isolated storm from Hwy406 in far northeast NM. 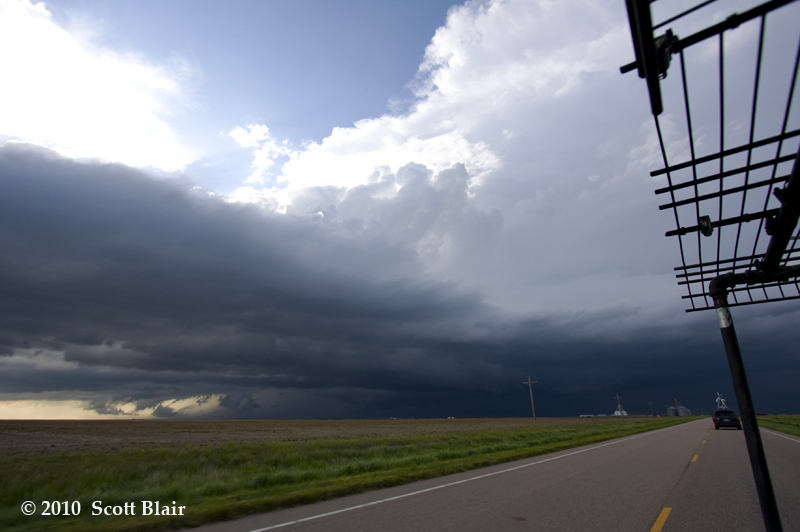 The storm contained decent structure, with two very long inflow bands on the north and south sides of the updraft, including a well-defined vault. Unfortunately as the storm moved east into OK, it likely crossed the warm front and began ingesting much cooler/stable air. It was fairly impressive how rapidly this storm choked once the invasion of low-level scud/haze intruded into the updraft base. The show was over by 7pm, and I ended the day in Guymon. 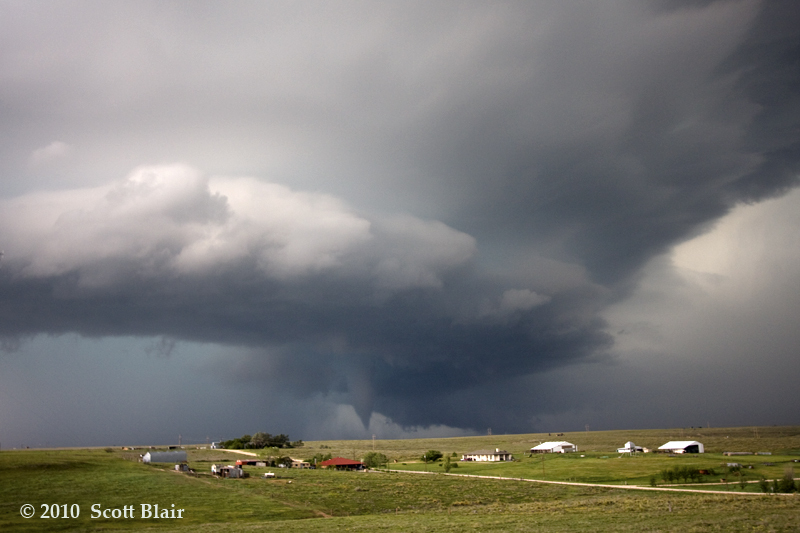 Additional Photos Here I was fortunate to observe ~13 tornadoes across eastern Colorado, generally along a SW-NE corridor from the John Martin Reservoir to Eads to Cheyenne Wells. The majority of these tornadoes were from separate occluding areas of rotation. All but one of the tornadoes appeared to have remained over open country, with one tornado striking a barn (rated EF1). Cloud bases were extremely low, making for a continuous challenge to stay in close range for photogenic purposes. My target for the day was an area from Lamar to Syracuse, and I gravitated towards the western portion of the target as ample surface heating materialized behind mid-morning convection. The initial cell developed around 12pm MDT south of Las Animas and moved northward as it organized. The storm appeared to split and began to deviate to the northeast within 30 minutes. As it neared Hwy50, a well-developed wall cloud formed underneath a fairly healthy-looking updraft. 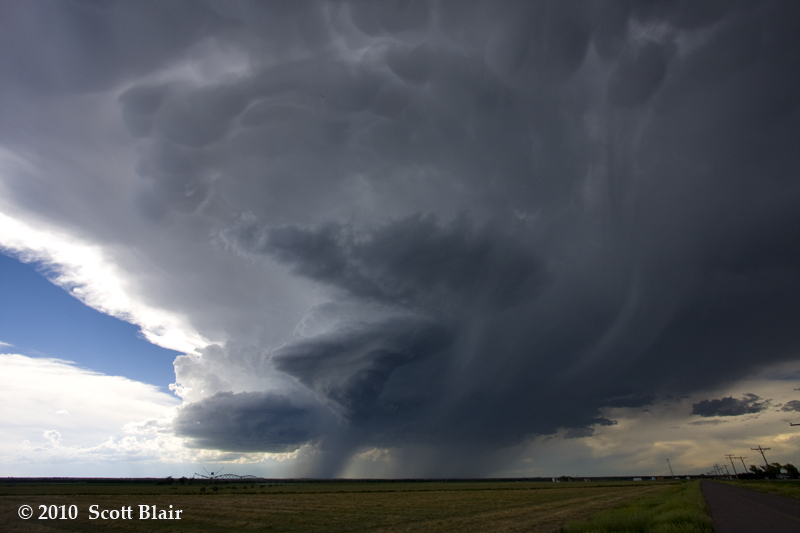 I stopped just west of Hasty, CO and watched the RFD occlude a portion of the updraft. 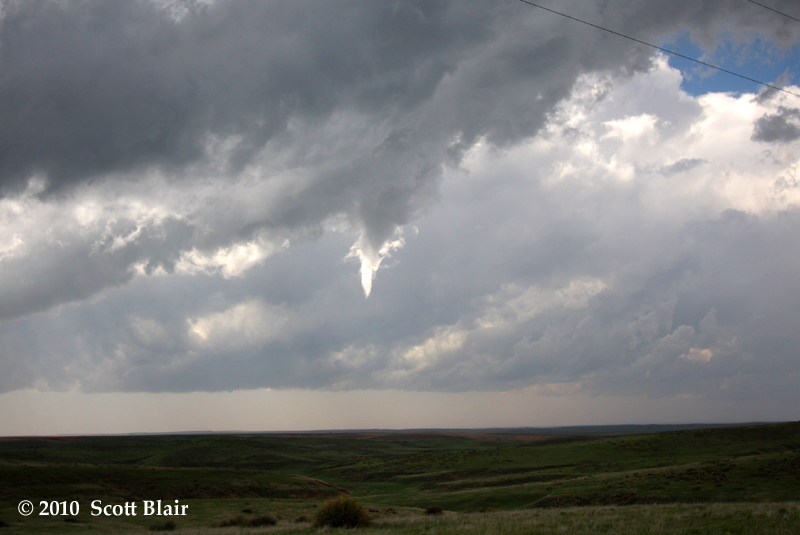 A bowl-shaped tornado formed by 1pm MDT and eventually evolved into a cone tornado. 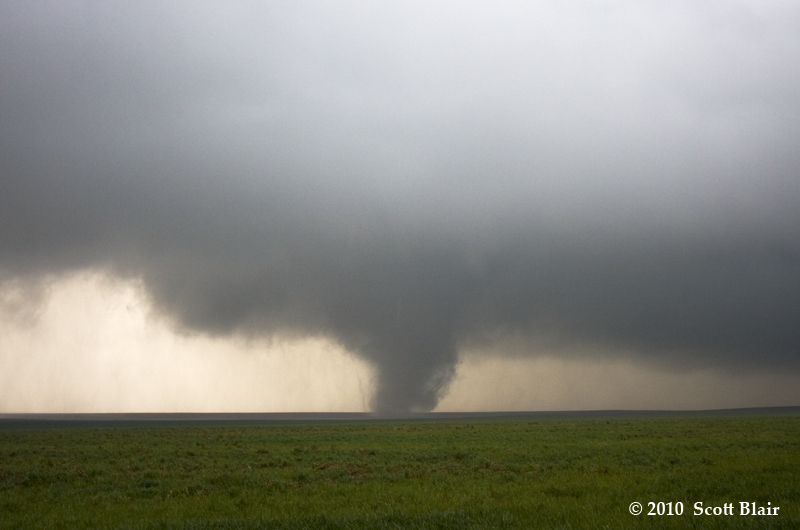 The tornado lasted for approximately 10 minutes with a secondary satellite tornado developing on the outer circulation. 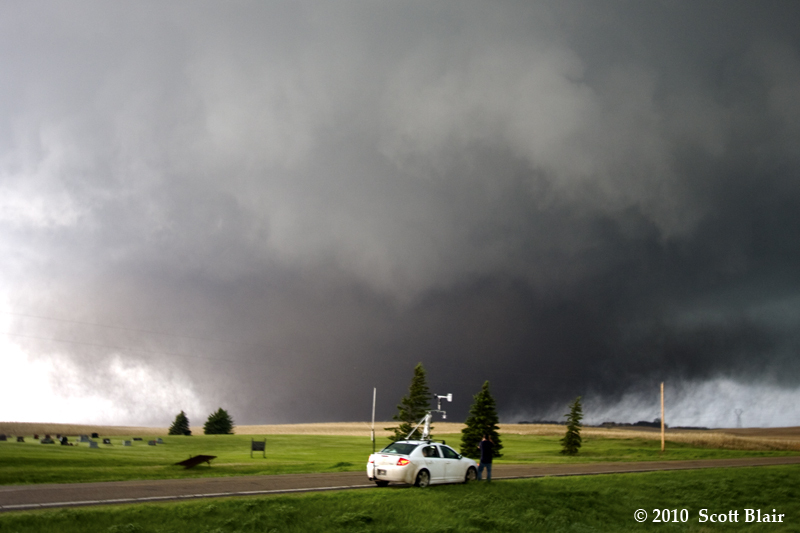 Numerous other tornadoes were observed hereafter; refer to the "additional photos" link above for further descriptions. Amos Magliocco and I observed 3 tornadoes associated with the long-lived supercell from Hartley to Dumas to Stinnett, TX. I departed Clovis, NM by mid-morning and met Amos near Nara Vista, NM. We waited in the target for a few leisurely hours before CI occurred just to our east. We made a large detour around the storm and finally jumped in excellent position west of Dumas. The first tornado we observed was located 2 WSW Dumas at 622 pm CDT, where it developed just north of the main hook echo precipitation blob. 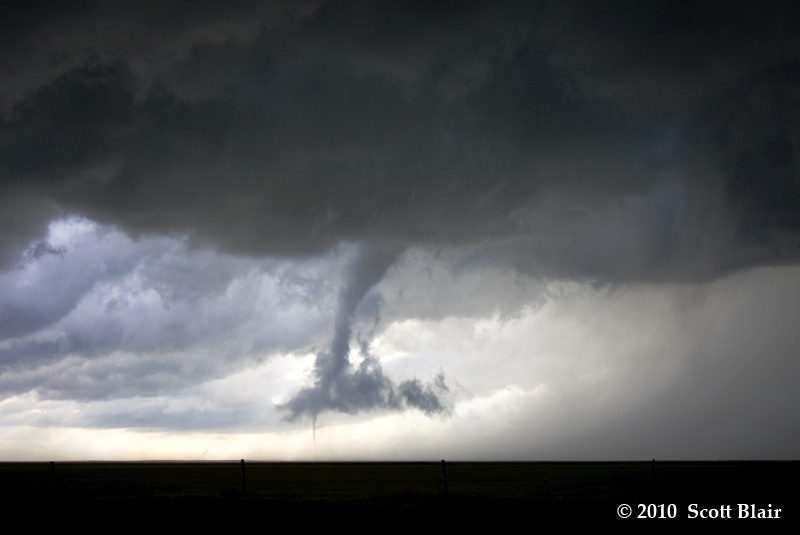 This tornado was a slender condensed tube that appeared to move south, presumably rotating around the edge of a larger circulation. The second tornado was observed just east of Dumas, lasting from 637-639 pm CDT. It was a condensed cone in an occluded region of the storm, near Hwy 152. 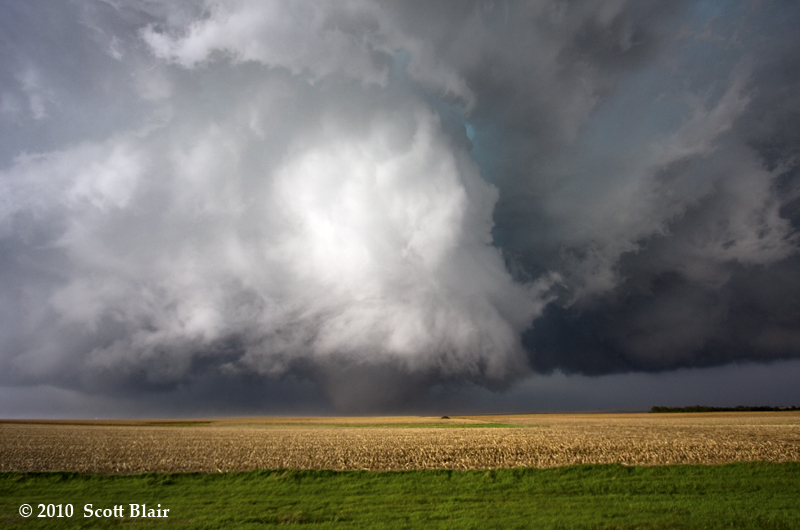 The final tornado came as a bonus as we blasted east to view the impressive storm structure. We pulled over on a great overlook north of Stinnett and observed a narrow cone tornado 4 NW Stinnett persisting from 738-743 pm CDT. With darkness approaching and limited road options, we happily elected to drive into AMA just before dark. Chased with Derek Deroche and Amos Magliocco for all/portion of the time and met up with Bob Fritchie and Rachael Sigler late in the day. Observed 2 tornadoes associated with the supercell that tracked from Leedey to Guthrie, OK. First tornado developed quickly in the life cycle of the storm with limited precipitation in the vicinity of the updraft. 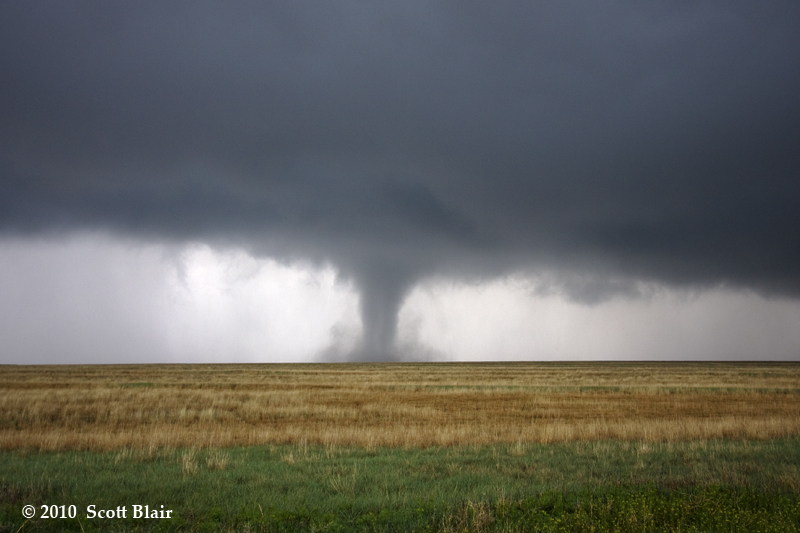 This vortex was located approximately 3 WNW Leedey from 321-325 pm CDT. 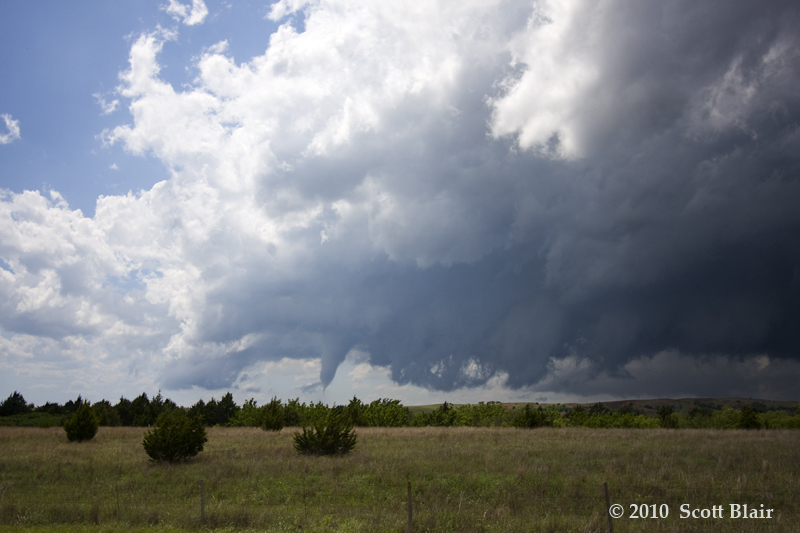 The tornado developed on the southern periphery of the large updraft base, in a cyclonic region where the RFD had created a horseshoe updraft shape. Tornado condensed more than half way to the ground, but a narrow debris whirl extended upwards into the condensation funnel. Thereafter, a plethora of roads were elected to stay ahead of the storm, including a very poor quality dirt-to mud-to water type road east of Putnam. Two hours later, we managed to reposition and observe a second tornado 7 WSW Dover from 545-549 pm CDT. The tornado was nearly rain-wrapped and developed within RFD-encircled precipitation and seemed to expand in size before becoming completely shrouded in precipitation. 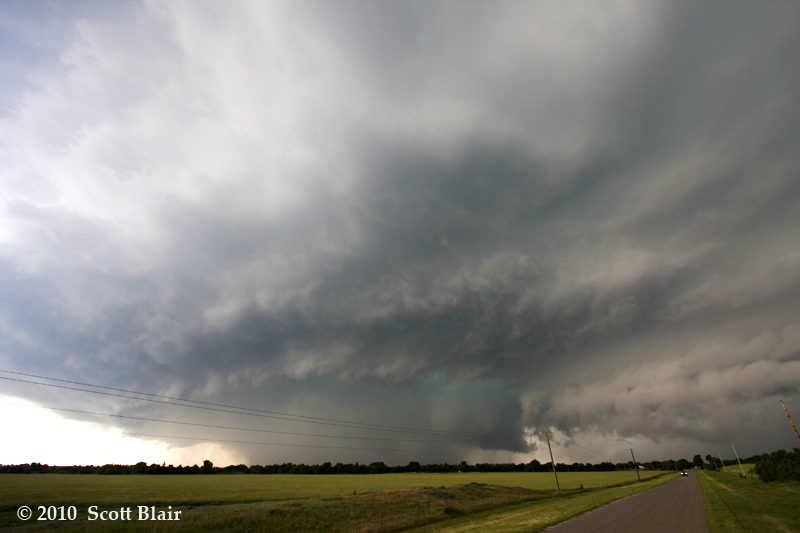 The storm began to appear slightly less organized by 7pm as it moved towards the traffic fiasco near Guthrie, OK. Upon experiencing that, it was easily decided to end the day and enjoy the company of friends in Edmond. Additional Photos Here I observed 3 tornadoes in far north central South Dakota, most notably an EF-4 tornado near Bowdle, SD. I was fortunate to share this experience with Derek Deroche and Amos Magliocco, along with others. 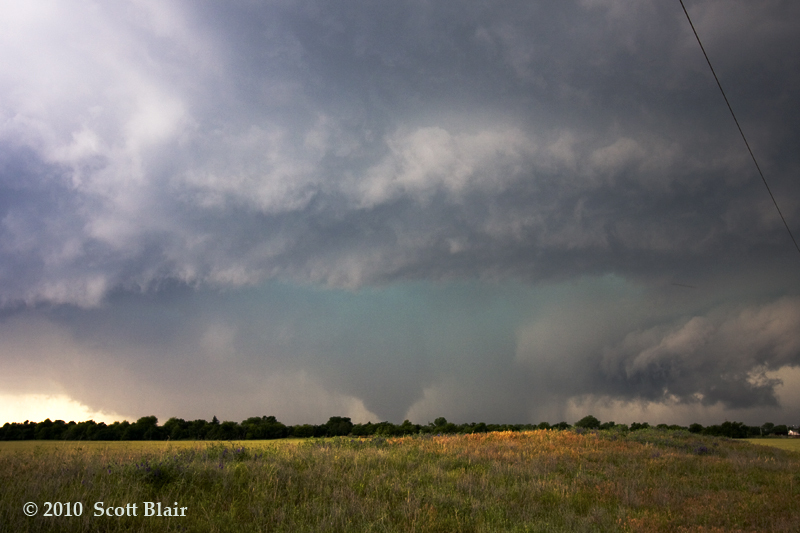 This long-lived tornado was on the ground for 35 minutes (6:10-6:45 pm CDT) and produced some of the most violent motion I've observed to date. 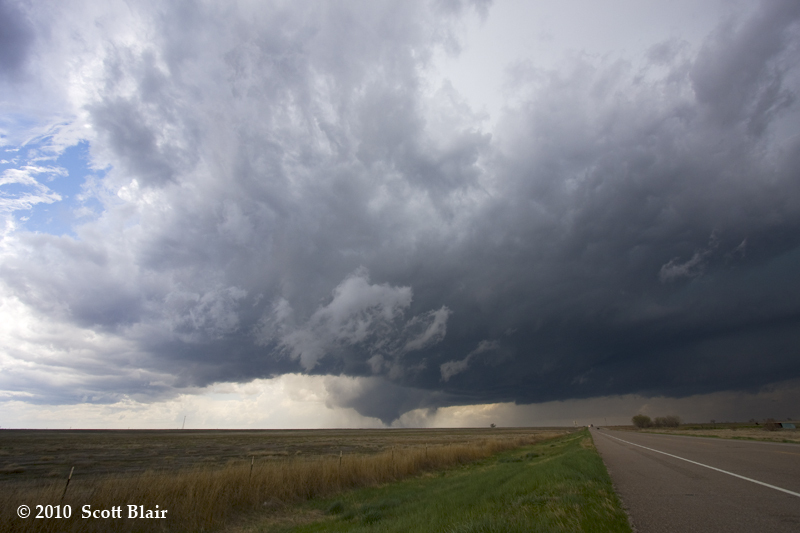 We departed around midday from North Platte, NE with an initial target near Pierre. By mid-afternoon near the triple point, we noted a small, congested area of towers in the vicinity of Akaska, SD and quickly moved northward to intercept the developing CB. The storm steadily increased in organization and intensity, both from a radar and visual standpoint. 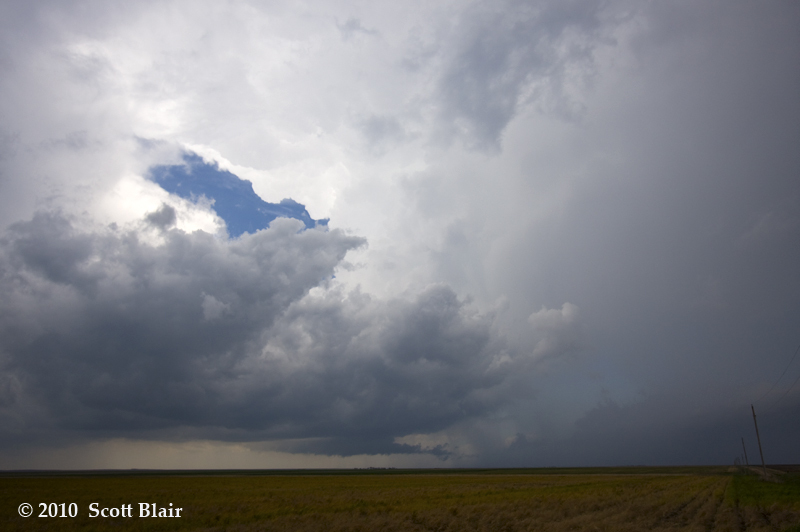 It eventually formed a nice overshooting dome and crisp, continuous updrafts on the western flank. Several tornadoes, including a violent wedge, were observed just as we placed ourselves in excellent position...click on the "Additional Photos" link above for further descriptions of the day. Made the long drive from Murdo, SD to western Kansas with limited sleep following the Bowdle day. Targeted just north of the warm front in Garden City and met up with Magliocco, Deroche, and Burtis. Multiple storms initiated, most seemingly struggling as overall shear and moisture was limited by late afternoon. Jumped on a decent storm northeast of Scott City, but a closed road and quick storm motions made this an impossible task. We took a gravel road westward through Pence and turned our attention to a more promising storm near Leoti. 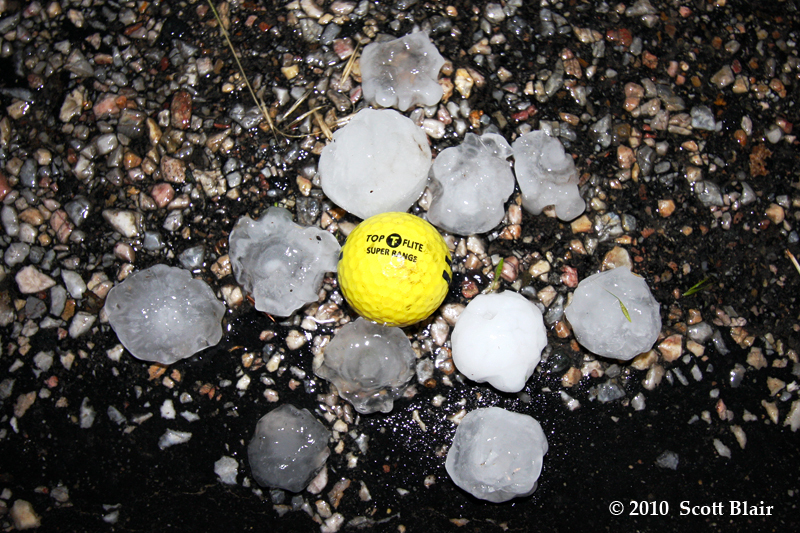 Observed a few golfball sized hailstones from the vault of the storm as we approached from the north. 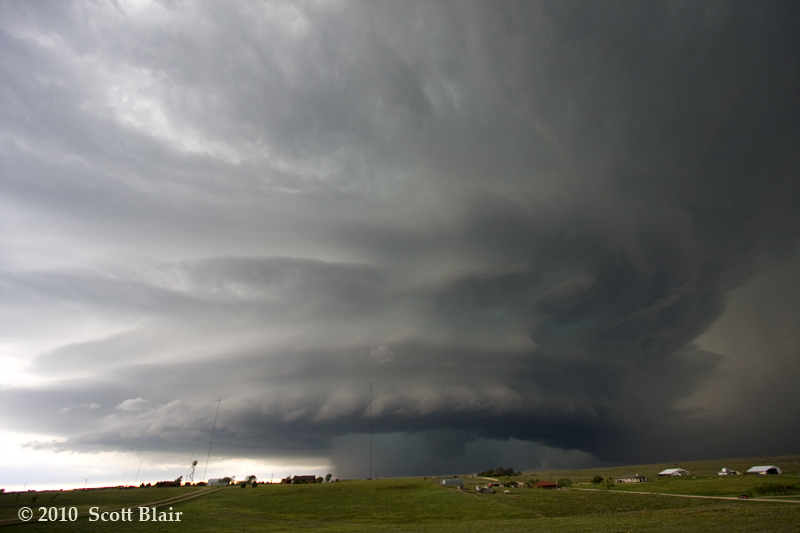 We paralleled the supercell along Hwy25 before it met a rapid demise following a RFD occlusion. 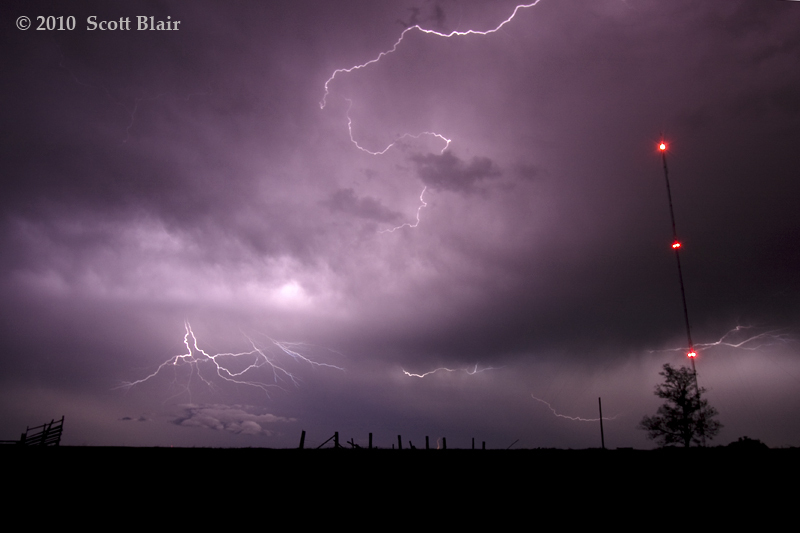 Storms just after dark became tornadic north of Goodland as low level shear and deeper moisture finally arrived. We ended the day in downtown Colby at a tasty restaurant. Derek Deroche and I targeted areas around GLD and watched a decent storm/borderline supercell mature SW of GLD, near Weskan, by 12pm CDT. The storm visually provided some hope early on, but ultimately the updraft base became narrow and extremely tilted over north of GLD. We anticipated new convection in the area, so we waited and were joined by Pam Murray. Two new updrafts developed by mid-afternoon near Bird City and we followed them up Hwy161. The lead updraft eventually withered away, but in the decaying process, a well-formed, mid-level rotating funnel cloud materialized. To our surprise, this feature persisted for nearly 7 minutes, keeping a vertical and pointy appearance with a nice bright white color. This made an otherwise uneventful day somewhat pleasant. Ended the day early and managed to get into a hotel before dark at Ogallala, NE. I departed Ogallala with an initial target of Burlington, CO. Convection developed to the south, so I bumped down to Sharon Springs then to Weskan. 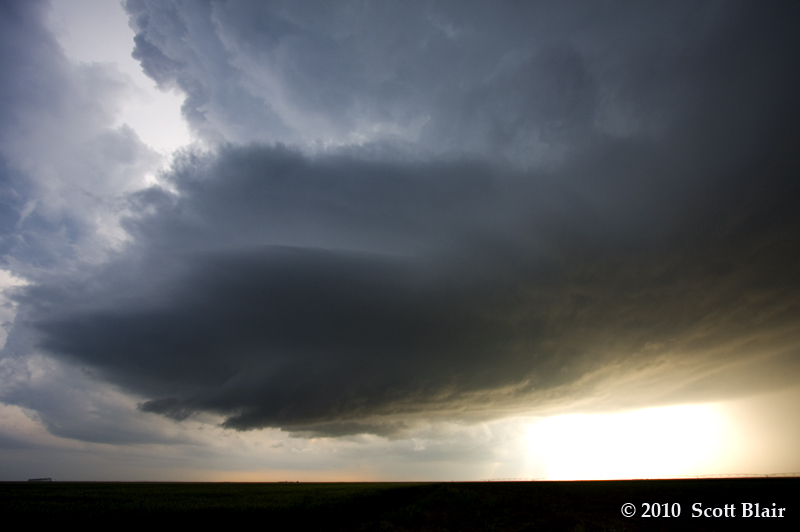 A nice, back-building supercell developed along the CO/KS border near Towner. I drove as far south as the paved road extended south of Weskan. I was hoping for the storm to eventually shift east or northeast, but visually as new updrafts developed along the western flank, it was obvious it wasn't going to make much distance. I had the option of testing ~10 miles of wet dirt road to get to Towner, but elected a safer route due to the high probability of becoming stuck. This had great consequences as the one hour long detour resulted in a missed opportunity to observe several photogenic landspouts that would have extremely easy to intercept from the dirt road option. Such is chasing! Regardless, managed to watch an interesting evolution of the storm, and observed two brief tornadoes (NE Towner and N Tribune). The latter tornado was a neat rope with decent motion from an occluding portion closer to the rear of the storm. 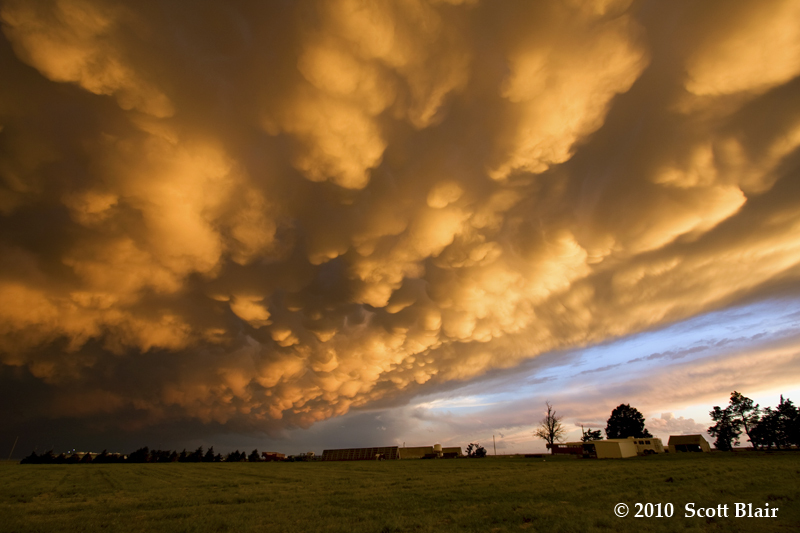 Ended the day with a pleasant photogenic drive of the backside of the storm and stunning mammatus near Colby. I departed Boulder at the onset of CI and fought through the awful traffic of the urban corridor. 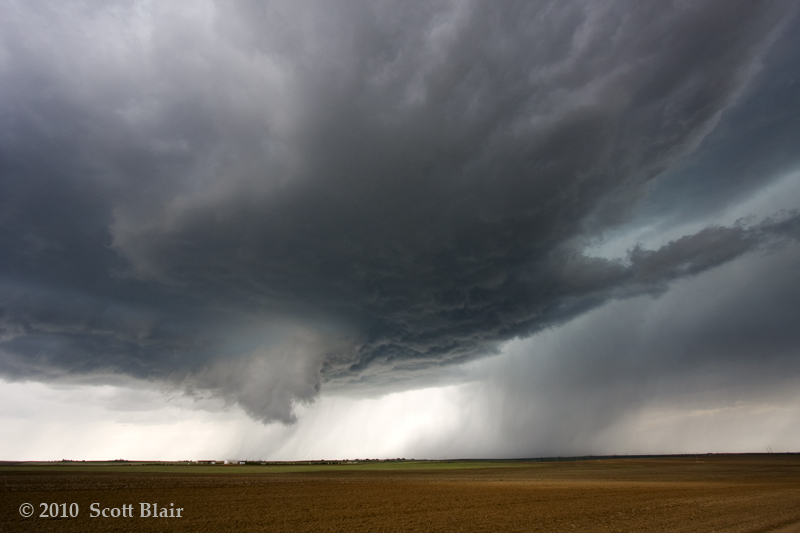 Managed to jump on a somewhat high-based supercell east of Brighton by mid afternoon. Slow moving, high-based storm had photogenic moments. 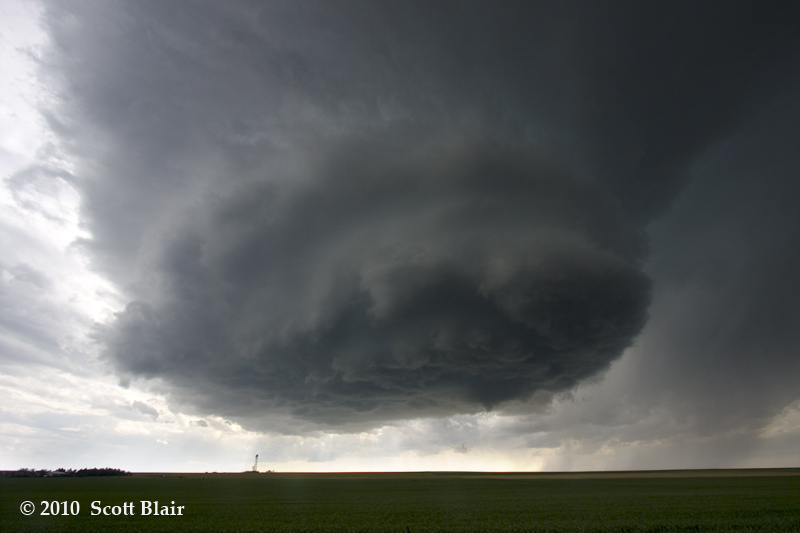 It occasionally managed to form a rotating wall cloud when the forward-flank core would visually dump large amounts of precipitation, then dissipate as the core became thin again. Highly doubt the validity of the tornado reports. Observers near the vault and hook region of the storm confirmed tennis-ball sized hail. Stayed ahead of this thing on both paved and dirt roads for nearly 4 hours, examined 1.75" hail south of Wiggins, and ended the day in Wiggins at a gas station. I jumped on a decent storm south of Fort Morgan by mid afternoon and watched it struggle for hours. 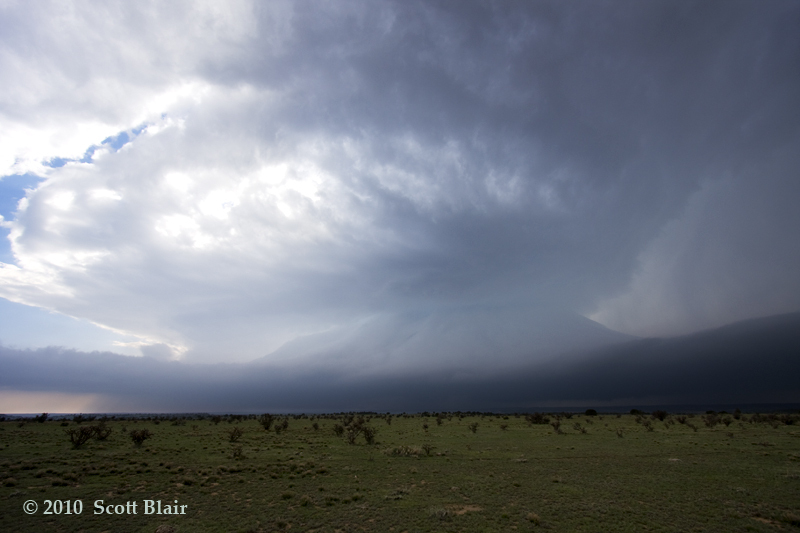 The storm was high-based, although some rotation was evident in the mid-levels per visual striations and radar SRM. As typical for the high plains of CO, the storm managed some photogenic moments as it moved along from Akron to Idalia over the course of several hours. 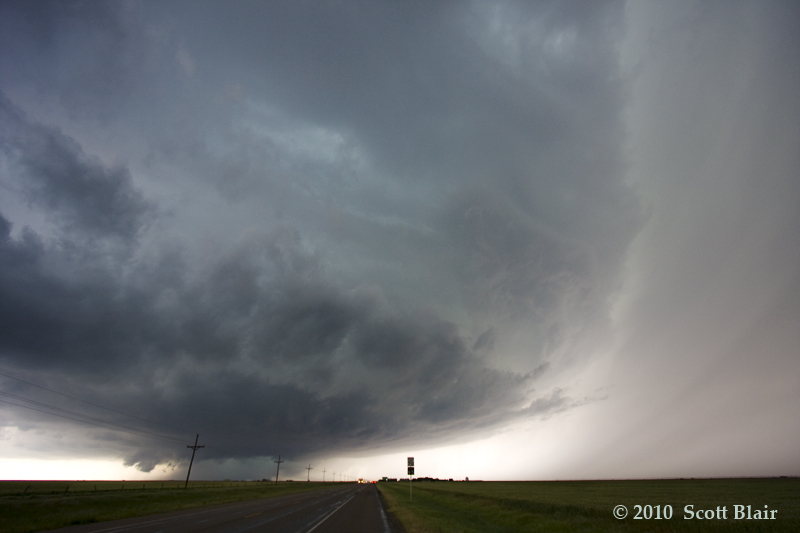 This included a brief encounter with some quarter-sized hail along a rural highway from a left-split storm. After giving up on the day and eating in Burlington at sunset, a cluster of convection evolved and headed toward NW KS. Managed to photograph a decent lightning show at Edson, complete with anvil crawlers and CGs, and then ended the long day in Colby with an awesome storm and great company. High-expectations result in marginal photogenic day. Derek Deroche and I once again blasted up to Scottsbluff-Torrington from NE CO. Initial storm appeared to become elevated upon our arrival. 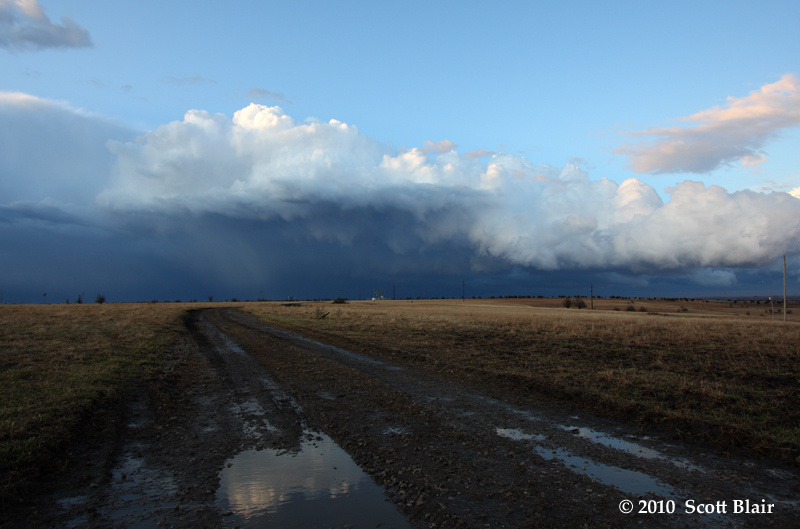 Attempted to follow it into the NE Panhandle, but limited roads and fast storm motion made this impossible. By early evening, turned our attention to a second supercell moving into the same worked-over airmass as the initial storm. Found some ~2" hail in between Scottsbluff and the Minatare Lake State Park and also along Hwy71. Through the core, we observed what appeared to be the souped-up gustnado, or weak tornadic circulation, that went through portions of Scottsbluff. No rooms/power were available in town, so we made the drive to Sidney and managed to photograph a few anvil crawlers just north of town on a hill. 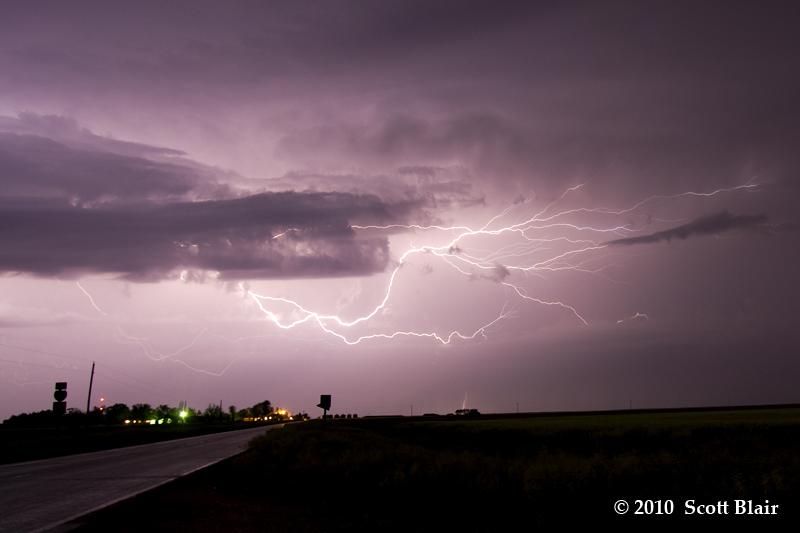 This was the final notable chase day of 2010. As always, I'm thankful for the friends out in the field to share in these experiences.